Creating a home you love is often overwhelming, time consuming and expensive. We’re here to show you there’s another way. Click the photo to find all details about each project. You aimlessly scroll through Pinterest feed pinning images to all of your beautifully organized boards, but you still have no earthly clue where to start? You’ve thought about how wonderful it would be to hire an interior designer, but feel like it’s something you couldn’t afford. You find DIY projects that you might like to try, but after reading the directions and looking at the supply list, all you want to do is crawl into bed, pop open a bag of chips and watch another episode of Fixer Upper. Farmhouse Living is a design studio in Rowlett, Texas . We believe homes should reflect the people who live, work, and play within. When I say E-Design, I don't mean that our team just sends you an inspiration board and then we call it a day. 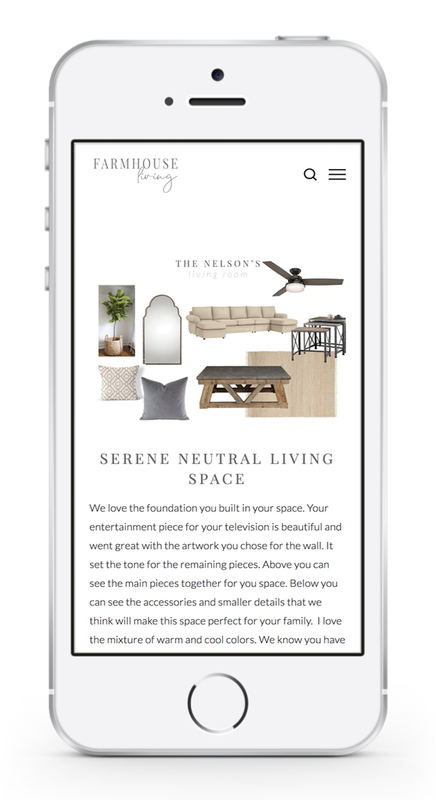 We work with your budget and style to create a space unique to you. We'll even incorporate any of your existing pieces into the room design. You send us pictures and measurements of the space. After we receive your info, we setup a call and then start developing a space plan and design board with a shopping list and access to designer sources! We send your first E-Design draft digitally, where you can send up feedback and we implement one round of revisions. After revisions you receive your final design in the mail. We provide you with the resources, inspiration and support for you to install at your own pace! Step 1: Fill out questionnaire. Here you'll capture photos of all walls in the room as well as the furniture that you're wanting to keep in your design moving forward. Step 2: Measure the space and submit photos and measurements. Step 3: Let's get inspired and collaborate with a Pinterest Board. Step 4: First draft of design and revisions. Step 5: Your design delivered straight to your door with a video. Samples of suggested fabric, paint, wallpaper, tile, wood, carpet, hardware, etc. Our team can't wait to work with you! We source from a wide variety of high quality retailers, wholesalers and trade-only vendors to find the perfect pieces for your space and budget. I only source from places I trust. My goal is always for quality and a great price. Is my budget large enough for design services? The answer is YES! We can work with any budget. The great thing about e-design is that you install at your own pace so if you need to work on purchasing your shopping list for a couple of months or even over a year that is totally doable. The great part about e-design is that once you have your shopping list in hand, you're free to do with it what you will. You can go online and buy everything at once or use it as a jumping off point and go find similar pieces yourself. It's up to you!